This is not likely a topic you think about often but these easy-to-follow tips can save you from headaches, financial loss and liability. If you hire private security this is what Business Owners and Property Managers need to know. Knowing the basics will keep you out of trouble with BSIS (Bureau of Security and Investigative Services), the California State Department of Consumer Affairs & State enforcement officers. Any person or company that provides private security, loss prevention, executive protection, private investigations or security officer training services must be licensed by the State. The State does not care what you call the person or what they look like. The State focuses on the duties that the person performs. So if you call them an “usher”, have them wear street clothes and a windbreaker but they perform access control, bag checks, identify & remove rowdy guests, etc. then licensing is required. If you call them a “doorman” and they wear street clothes but their jobs includes access control, checking ID’s and removing unruly patrons then licensing is required. California State licensing requirements are among the most stringent in the nation with significant penalties for anyone found to be in violation. BSIS refers to a private security company as a PPO (Private Patrol Operator). Any company that provides people acting in a roll that might be considered a security or protective function are required to have a PPO license issued by BSIS. PPO’s employ uniformed and plainclothes security officers, loss prevention personnel and executive protection agents and dispatch them to protect persons or property or to prevent theft. This PPO license allows you to hire employees (not “independent contractors”) that you provide to people or businesses. If you are a “temp agency” and hire out “night watchmen” then you MUST have a PPO license issued by the State. PPO licenses are issued by the California State Department of Consumer Affairs, Bureau of Security and Investigative Services. Anyone that provides services that does not possess a valid PPO is committing a crime under California State Business and Professions Codes. If a company or individual offers these services under a different name or appearance and say that a PPO is not required they are operating illegally. The safety and security of your customers, employees, products, property and assets depends upon the private security vendor that you choose to hire and you should REQUIRE your security provider to prove that they & their employees are properly licensed & registered with the State. Click here to verify their license. 1. Your security vendor MUST possess a valid PPO. 2. All people working for them providing security services must also be registered with BSIS. 3. Make them provide you with a copy of their PPO & verify the “Guard Card” for each officer. 4. Go to the BSIS website to verify their licensing is valid. All employees whose duties include a security, protective or loss prevention function, whether in uniform or plainclothes, whether they are an employee of your security vendor (PPO) or your own employee (Proprietary), must undergo a State required background check undergo State mandated training and possess a valid registration certificate from the BSIS. The registration certificate for an employee of a PPO is called a “Guard Card”. Anyone working for a PPO is required to possess a valid Guard Card at all times while on duty. Failure to produce a Guard Card upon demand is punishable by a fine and administrative action from the State for both the security officer AND the PPO. The registration certificate for a Proprietary Security Officer (your own employee) is called a “PSO”. Private security officers MAY NOT enter into an agreement (contract) to provide security services. Only a PPO may do this. Anyone providing security, protective or loss prevention services with only a Guard Card (and no PPO) is committing a crime under California State Business and Professions Codes. 1. Only a PPO can contract to provide security officers. 2. All employees of your PPO must possess a valid “Guard Card” issued by BSIS. 3. If your employees engage in security, protective or loss prevention functions they must possess a valid PSO issued by BSIS. Security officers, alarm company employees, private investigators & executive protection agents, whether they are employees of a PPO or your own employees, may not carry a weapon unless they also have also possess a valid Firearms Qualification card & Guard Card issued by BSIS. 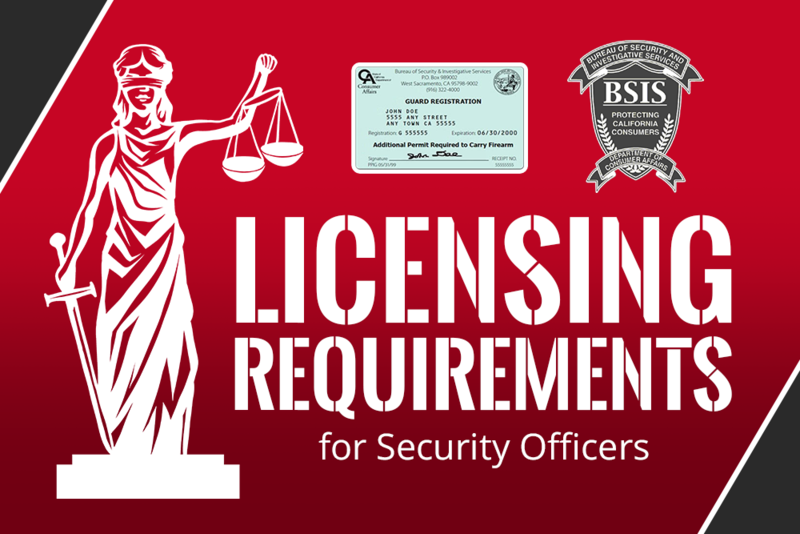 The BSIS issued firearms card must also indicate they are qualified in the same caliber of firearm they are carrying. Off duty law enforcement officers who are working as security or personal protection must also comply with this requirement. A concealed firearm may not be carried unless they also possess a valid CCW (Carry Concealed Weapon) issued by their local law enforcement agency. Failure to comply with these requirements is a criminal offence and may result in immediate arrest and eventual prosecution and revocation of any permits or licenses that may have been issued by BSIS. In all cases they must have the valid permit for these weapons in their possession while they are carrying the weapon(s). If you choose to allow these items to be carried by security officers on your property you should require proof of training, although none if required by BSIS. Cities and counties often require that business operating in their jurisdiction possess a current business license issued by the municipality. Many times people hiring private security mistake a city business license as the company being “licensed” to provide security. Remember that any company you hire to perform private security must provide you with both a PPO issued by BSIS and a business license issued by your local municipality. Follow us on Twitter or join us on Facebook to learn more about the security industry and to protect yourself from common pitfalls.